Join me for the information-packed I Can Do It! IGNITE conference as I take the stage with Wayne Dyer, Doreen Virtue, Mike Robbins, Robert Holden, Julie Daniluk, Caroline Myss and Hay House’s new cutting-edge authors, speakers, and documentary filmmakers. The I Can Do It! IGNITE conference is a brand-new, fast-paced format that features 20-minute keynotes from trendsetting speakers who will IGNITE your passion with topics ranging from relationships, sexuality and personal transformation to mindfulness, youth empowerment and so much more! If you have been searching for the mindful resilience needed to face today’s personal, political, and financial challenges, look no further! IGNITE your spirit with empowering concepts that you and the next generation can use to create a happier, healthier life. Register today to reserve your seat and access that untapped energy and inspiration that exists in all of us! CLICK HERE for complete details and to register online. The I Can Do It! 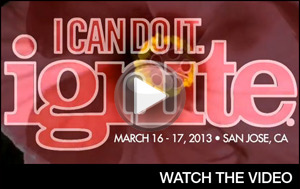 IGNITE conference is held at San Jose Center for the Performing Arts on March 16-17, 2013. I would love to see lots of you there.